Australia’s Navy has enjoyed a long association with Brisbane that dates back to colonial times when the Queensland Marine Defence Force (QMDF) was raised in 1883 to provide for local naval defence. 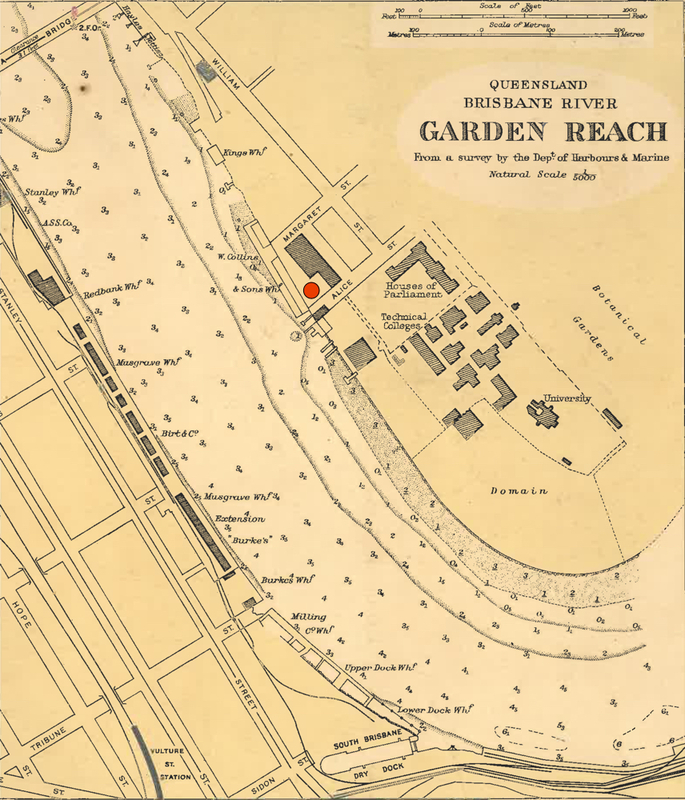 In 1911 the Royal Australian Navy (RAN) took control of the former QMDF depot in Alice Street, in the area known as Garden Reach on the Brisbane River, near the domain. Its principle purpose was the training of men in the Naval Reserves. The depot was first established in the late 1880s, comprising a slipway and a shed, and was home to the colonial vessels Mosquito and Midge. At the outbreak of World War II, on 3 September 1939, the Alice Street depot commissioned as HMAS Penguin (IV). Other sites were also used by the RAN including the former offices of the QMDF situated at nearby Edward Street from where the Queensland District Naval Officer and his staff discharged administrative duties. A naval stores facility, established at Kangaroo Point in 1887, as well as an oil fuel installation also came under the authority of Penguin (IV). On 1 August 1940 Penguin (IV) was renamed HMAS Brisbane to better reflect its locality. The Naval Offices situated at Edward Street. Japan’s entry into the war in December 1941 saw south east Queensland become an important strategic hub following an expansion of the Allied presence in the Brisbane area. A US submarine base was established at New Farm http://www.navy.gov.au/history/feature-histories/usn-submarines-based-brisbane-during-world-war-ii , additional naval stores depots, victualing yards and maintenance facilities were created and there was an increased throughput of personnel to serve in combined operations training camps situated at Toorbul and Bribie Island. An effective examination service, Port War Signal Station and mine watching service were also operated by the RAN, as was a small ships base situated at Colmslie. The Colmslie base was established in late 1942 to support Fairmile motor launches and the smaller Harbour Defence Motor Launches (HDMLs) as they came into service. It was routinely used as a staging point for vessels transiting north for service in Darwin, Timor and New Guinea waters and in 1946 it saw the return of many of those vessels. Numerous Fairmiles and HDMLs were decommissioned at Colmslie and disposed of from there in 1946 as the RAN reverted to a peacetime footing. Coinciding with this expansion was a decision to recommission Brisbane as HMAS Moreton on 1 October 1942. The chief reason for doing so was to remove confusion arising between the similarity in titles of the Naval Officer-in-Charge Brisbane (the area) and the Commanding Officer of Brisbane (the depot). 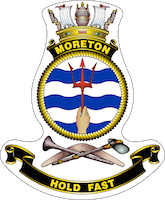 The first unofficial badge for Moreton had its origin in the Colmslie Fairmile base which came under the administration of Moreton. The badge depicted a bow-on view of a motor launch at speed, in a rope circle, surmounted by a Naval Crown. Beneath was a motto in Latin which read ‘Ago Quod Ago’ the meaning of which is ‘What I do I do’ or ‘What I do, I do well’. As Moreton, the Alice Street depot played an important role as the initial point of entry for the many Queenslanders who served as ‘hostilities only’ members of the Royal Australian Naval Reserve (RANR). 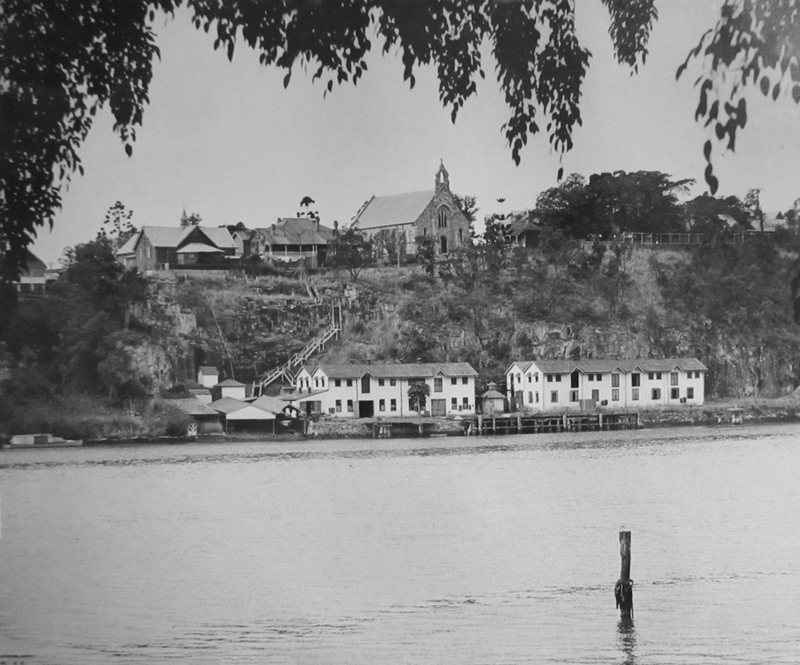 Consequently, the premises were improved to provide barrack style accommodation and other amenities which included facilities for members of the war-raised Women’s Royal Australian Naval Service (WRANS). The tasks carried out by the members of the WRANS based in Moreton were many and varied. 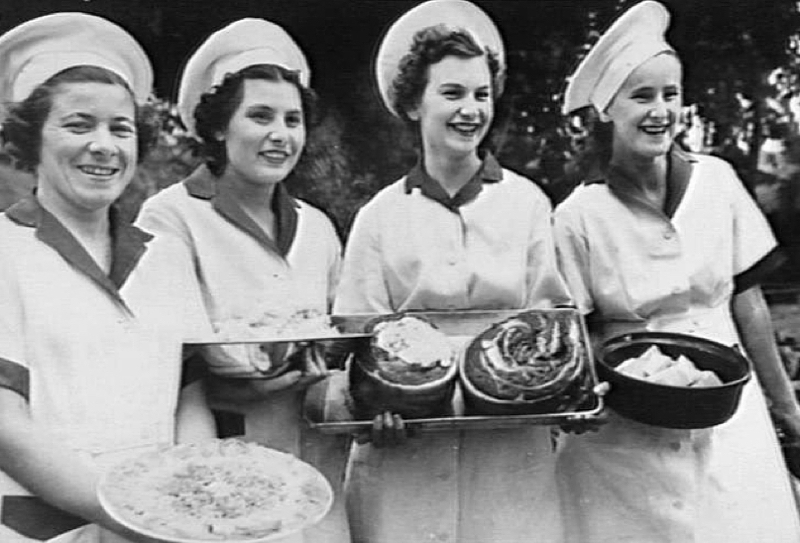 Cooks, stewards, telephonists, drivers, seamstresses, coders, wireless telegraphists, signalers, writers and stores assistants could be found employed in various locations scattered around the Brisbane area, all of whom played a valuable role in supporting the war effort. Members of the WRANS performed myriad roles in support of operations in South Queensland. By October 1944 Moreton was also responsible for administering operations, intelligence and communications staffs attached to Allied Headquarters, Allied Naval Headquarters and Naval Staff in depots throughout Queensland and New Guinea. With the cessation of hostilities in 1945, Moreton was used as a demobilisation facility for those returning from active service. 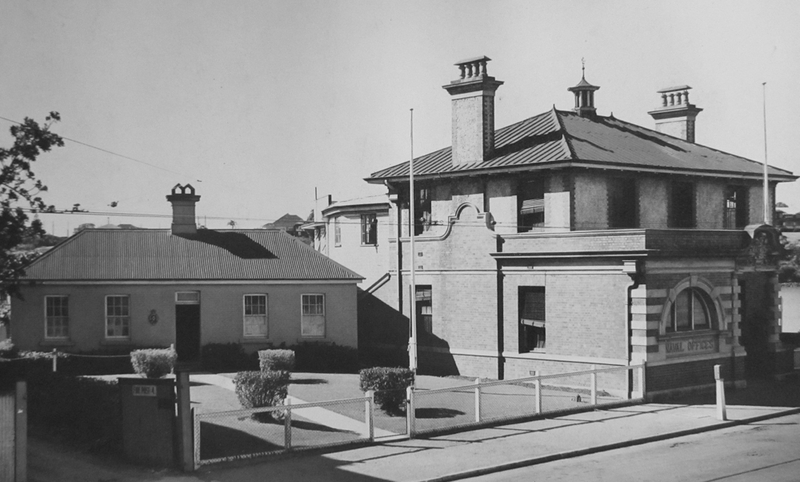 A decision to disband the Naval Reserves in 1946 saw the Alice Street depot temporarily close and decommission, although the name Moreton continued to be used in connection with the administrative duties of the Resident Naval Officer situated in nearby Edward Street. In 1949 the Alice Street depot was reactivated as a reserve training depot providing Naval Reserve personnel, including National Servicemen and later Sea Cadets, with instruction across the many facets of naval life. In early 1952 reserve training was moved across the Brisbane River to facilities at Kangaroo Point. Access to the Kangaroo Point facility was either by boat or by 154 steps from nearby Main Street. The Kangaroo Point facility with the steps visible in the background. 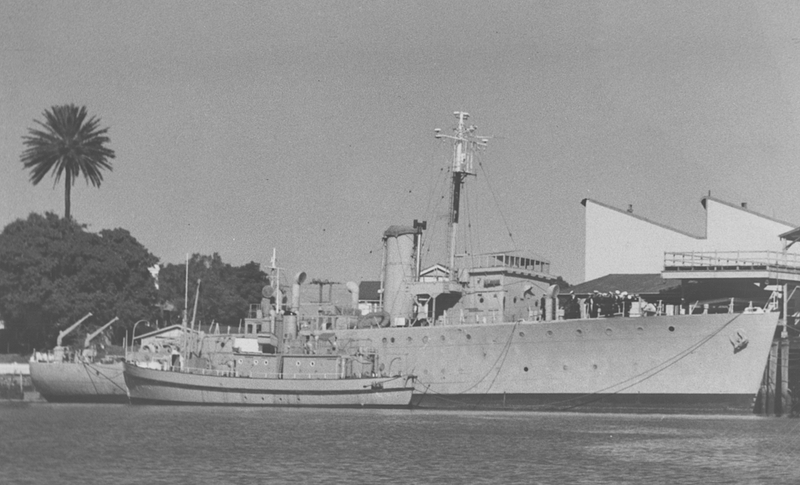 During that period the former RAN corvette HMAS Mildura was acquired as a static training ship, a role in which she provided valuable service until being sold for scrap in 1965. In 1959 training was relocated to premises on Merthyr Road, New Farm, a facility previously used by the Royal Navy from 1944-1949 as a victualling yard in support of the British Pacific Fleet. The former RAN corvette Mildura alongside HMAS Moreton at the New Farm premises. In 1960 the New Farm premises, encompassing three hectares of waterfront real estate and wharfage, commissioned as HMAS Moreton. Over the next three decades it served as home to the Brisbane Port Division of the RANR as well as the Sea Cadets, later renamed Naval Reserve Cadets. Several vessels were assigned as tenders to Moreton including General Purpose Vessel (GPV) 957 and Motor Refrigeration Lighter (MRL) 253. The latter was subsequently renamed Training Vessel (TV) Gayundah proving to be an ideal platform for seamanship and navigation training. 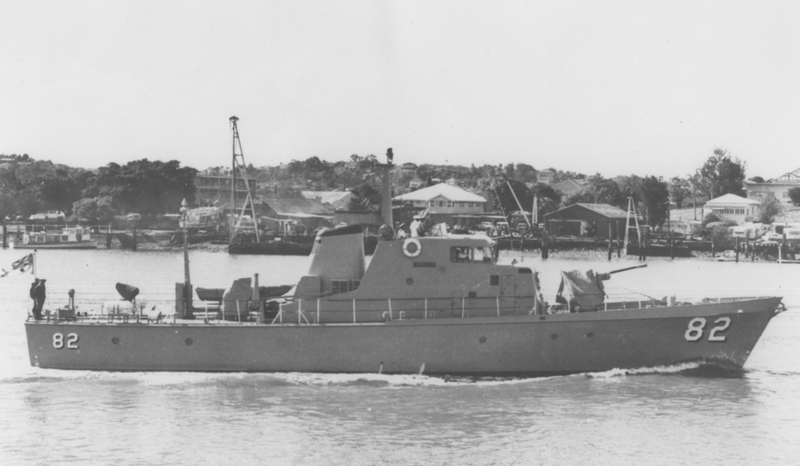 The Attack class patrol boat HMAS Adroit was another that became a familiar sight on the Brisbane River when it was assigned to Moreton as a Reserve training vessel following her commissioning at New Farm on 18 August 1968. She served in that capacity until August 1974 after which she joined the permanent RAN fleet. 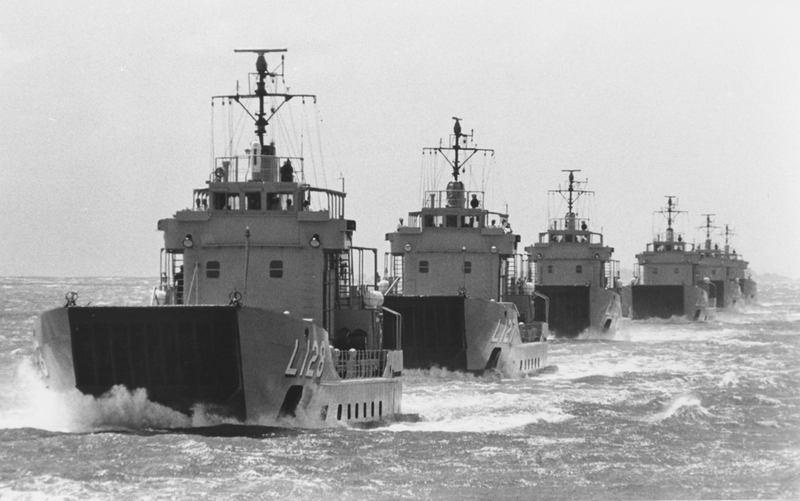 In 1973 the first of the RAN’s landing craft heavy (LCH), HMAS Brunei, was commissioned and based at Moreton which thereafter became the Headquarters of the 1st Australian Landing Craft Squadron. In 1979 the title was changed to the Australian Amphibious Squadron to encompass the introduction into service of the amphibious heavy lift ship HMAS Tobruk (II). 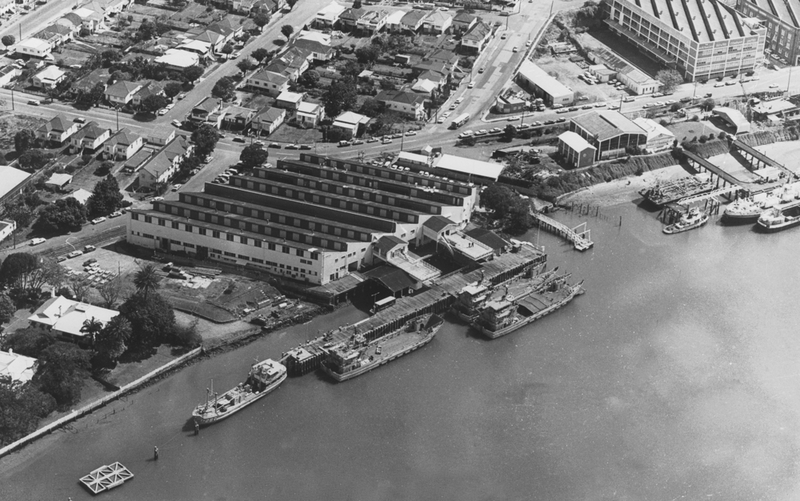 This additional role saw a requirement for a wharf capable of berthing Tobruk as well as the six LCHs, consequently, in 1981, the Capricorn wharf and buildings situated downstream from Moreton were leased for that purpose before being purchased in 1982. This area became known as Moreton (North). In early 1986 a decision was made to disband the Amphibious Squadron. Tobruk was home-ported to Sydney and the LCHs were transferred to Cairns and Darwin. One LCH, HMAS Labuan, was retained in Brisbane in support of Naval Reserves training. Left: MRL 253, later renamed TV Gayundah, proved to be an excellent training vessel for members of the Brisbane Port Division of the RANR. Right: Captain Bill Owen, RAN who oversaw the purchase of the Moreton North facility. 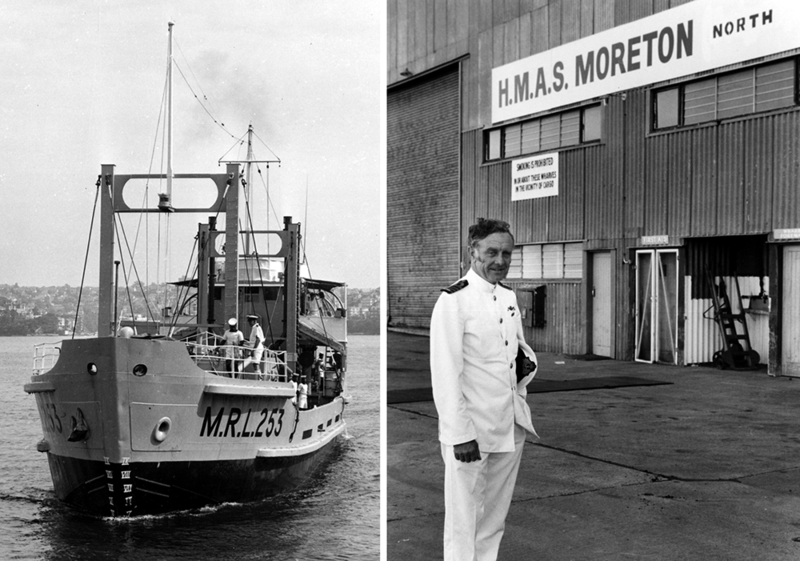 Until the end of 1985 Moreton was home to over 1000 permanent naval personnel and their dependents, seven ships, nearly 200 active RANR personnel and the Queensland Division of the Naval Reserve Cadets. It also hosted a 100 strong lodger cadet unit, TS Gayundah. The RAN's six heavy landing craft and HMAS Adroit became familiar sites on the Brisbane River and alongside Moreton. 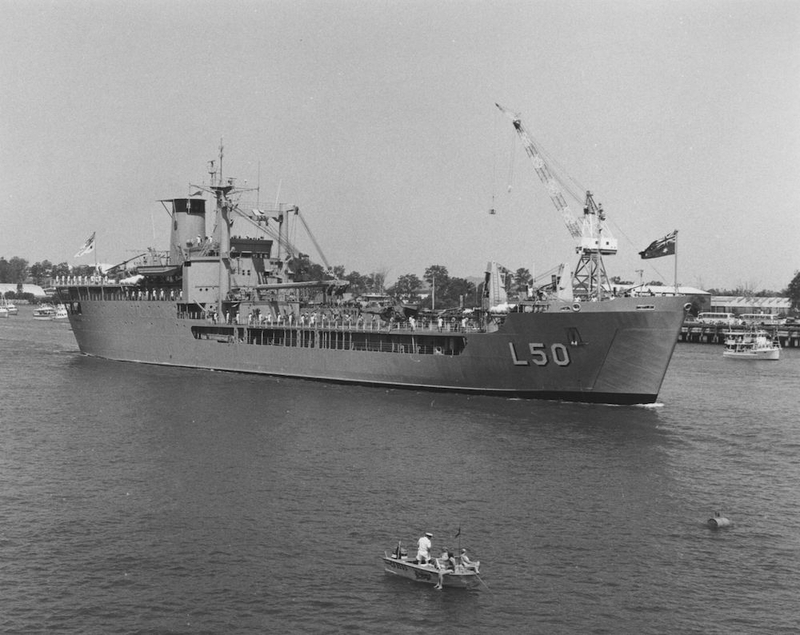 HMAS Tobruk entering Brisbane in 1982 on the occasion of the Commonwealth Games. In 1976 the office of Naval Headquarters Queensland was relocated from its long time residence in Edward Street, Brisbane to a leased office facility as part of the Defence Regional Office (Level Four at 288 Edward Street, Brisbane). Here it remained for ten years until the Naval Officer Commanding Queensland (NOCQLD) role was subsumed by the commanding officer of HMAS Moreton in 1986. The original Naval Headquarters building was added to the Queensland Heritage Register on 21 March 2013. Moreton (North) was sold in 1998, having fallen into disuse. In its scaled down role, Moreton continued to represent naval shore based interests in the Queensland area south of the Tropic of Capricorn. Its staff provided administrative and logistic support to visiting naval ships and craft and it continued in its long time role as the home of the RANR and Naval Reserve Cadets. An aerial view of Moreton with several of the RAN's LCHs secured alongside. In August 1992 Labuan ceased supporting Naval Reserve training in Brisbane and was reassigned to the RAN fleet. The following year the Government announced that three RAN establishments, including Moreton, would be closed as cost saving measures. 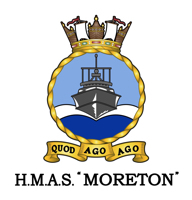 Moreton was officially decommissioned at 12:00K on 11 May 1994. A Naval Support Office was subsequently established at Bulimba Barracks and a Personal Services cell in Victoria Barracks to support those naval personnel and their families remaining in the Brisbane area. In 2008 Bulimba Barracks was classified as a multi-user depot providing support to various Defence functions in the Brisbane area. Joint Logistics Unit South Queensland was the primary unit within Bulimba Barracks and Navy Headquarters (NHQ) South Queensland became a resident unit. In 2014 a decision was made to dispose of the majority of the 23 hectares of Defence land at Bulimba Barracks. A small portion of land, on which NHQ South Queensland was situated was retained and due to increasing naval activity in the district a determination was made to commission the facility, again using the name Moreton. HMAS Moreton officially commissioned on 14 May 2016 under the command of Commander Peter Tedman, DSM, OAM, RAN. HMAS Moreton provides a shore based capability in South East Queensland to support RAN operations. This includes the administration of Navy personnel in the area, supporting visiting Australian and foreign warships and promoting the activities and achievements of the RAN through an active community engagement program. The commanding officer of Moreton maintains strong relationships with the local community and attends key Defence and civic ceremonies such as Anzac Day and Navy Week. The area of operations for which HMAS Moreton is responsible encompasses 22,000 square kilometres from the New South Wales border to the Tropic of Capricorn and includes the regions of Brisbane, Gold Coast, Sunshine Coast, Wide Bay and the Darling Downs, all of which are productive recruitment areas for the RAN. The establishment has a small permanent Navy contingent and is also home to a number of RAN Reserve units including RANR divers and the Queensland detachment of the RAN Band. The facilities also accommodate the Australian Navy Cadet Training Ship Gayundah.